EMDR training for therapists who work with both adults and children – accredited by EMDR Europe – led by Dr Robin Logie, Clinical Psychologist and EMDR Consultant and Trainer. Eye Movement Desensitisation and Reprocessing (EMDR) therapy is one of the most significant and innovative recent developments for the treatment of conditions related to trauma and adverse life experiences. During processing with EMDR therapy, disturbing events, frozen in time, are processed to adaptive resolution. Supported by extensive research, EMDR is recommended for the treatment of PTSD in national and international guidelines including the National Institute for Health and Care Excellence (NICE) and the World Health Organisation (WHO). Its effectiveness with many other psychological disorders has also been established. This is a hands-on clinical skills training in the application of EMDR for a variety of psychological disorders in both adults and children. 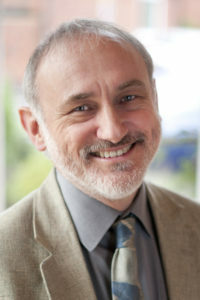 Known for his clear teaching style with its blend of warmth, humour and humility, Dr Robin Logie provides interactive, trainee-centred, small group EMDR training. All trainees will practise and receive EMDR during the training – the most effective way to learn the necessary skills. The number of participants is limited to a maximum of 24 and Robin will be assisted by experienced EMDR Facilitators and Consultants to ensure that each trainee can be afforded individual attention. This EMDR training provides participants with theory and skills that can be immediately put to use.